Red Palm or Coconut Palms grow in the tropics worldwide. Palm wood is notoriously hard to work. Palm grows woody tuberous tissues that transport water and nutrients to the leaves. The darker fibers are brick bat hard and the lighter fibers are very very soft. This make Palm Wood very difficult to machine and it must be stabilized with an acrylic polymer before we can work it. All that extra work does pay off though. Palm wood is the only wood in the world with a striped polka dot pattern. Red Palm in particular, has a finer dot pattern with reddish brown dark fibers and lighter contrasting wood in between. 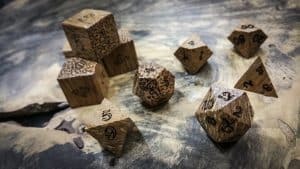 NOTE: Palm woods splinter very easily, so all 4 and 5 d6 sets will have the pips engraved into the dice. You keep it up now, undnsrtaed? Really good to know.